Social work as a profession and academic discipline has long centered women and issues of concern to women, such as reproductive rights, labor rights, equal rights, violence and poverty. In fact, the social work profession was started by and maintained in large part by women and has been home to several generations of feminists starting with recognized first wave feminists. This wide-ranging volume both maps the contemporary landscape of feminist social work research, and offers a deep engagement with critical and third wave feminisms in social work research. 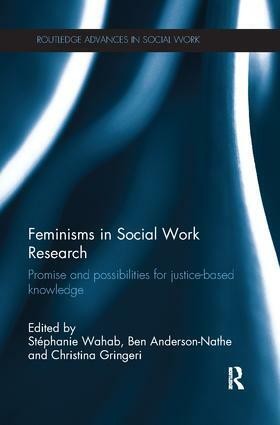 Showcasing the breadth and depth of exemplary social work feminist research, the editors argue that social work’s unique focus on praxis, daily proximities to privilege and oppression, concern with social change and engagement with participatory forms of inquiry place social workers in a unique position to both learn from and contribute to broader social science and humanities discourse associated with feminist research. The authors attend here to their specific claims of feminisms, articulate deep engagement with theory, address the problematic use of binaries, and engage with issues associated with methods that are consistently of interest to feminist researchers, such as power and authority, ethics, reflexivity, praxis and difference. Stéphanie Wahab is an Associate Professor at Portland State University’s School of Social Work, USA, and Honorary Research Associate Professor, Department of Sociology, Gender and Social Work, University of Otago, New Zealand. Ben Anderson-Nathe is Associate Professor and Program Director of the Child and Family Studies program at Portland State University, USA. Christina Gringeri is Professor in the College of Social Work at the University of Utah, USA.